A suspected arson attack at a centre for asylum seekers is the second in six weeks and has provoked fears of a violent campaign by the extreme right in the 26 Counties. 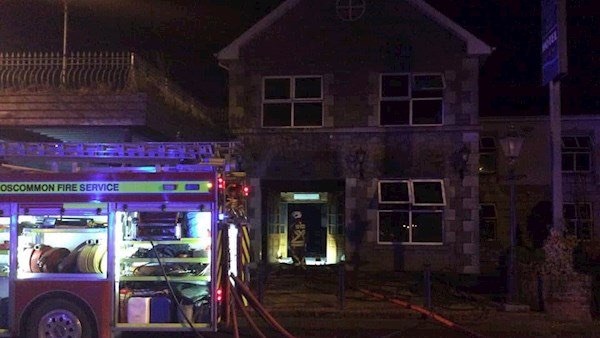 The fire, at Shannon Key West Hotel in Rooskey, County Leitrim, was started by two men who smashed their way into the building through a rear window. It comes after a similar incident at a proposed asylum seeker centre burned down at the Caiseal Mara Hotel in Moville, County Donegal. Local Sinn Fein councillor Seadhna Logan who visited the scene on Friday said he was “absolutely disgusted” at the attack and the apparent attitude behind it that “it is better to burn a vacant property than to use it for refugees”. Asylum seekers are provided with basic shelter and accommodation pending the processing of their applications in a 26 County system known as ‘direct provision’. They are housed in centres which operate in a manner similar to open prisons. The former Shannon Key West and Caiseal Mara hotels were two of three planned new centres due to be opened in coming months. Some 6,000 people, roughly 0.1% of the Irish population, are today living in direct-provision centres. Mr Logan said he knew there was concern in the community about plans for a direct provision centre there “but I very much doubt if this was locally driven”. He said, while people had legitimate concerns, he did not believe this level of hostility existed in the community. But there are fears that the south could be getting a taste of the organised racist violence long a feature of loyalist areas of the north. This week, loyalist paramilitaries were blamed for a baseball bat attack on five Romanian men. A gang of men forced their way into a house in Hollybank Drive in Newtownabbey, County Antrim and attacked the occupants. The victims, originally from Romania, suffered numerous injuries and one was taken to hospital. Neighbours were alerted by the sound of breaking glass. One woman, who did not wish to be identified, described the scene as she tried to help the victims. “Every window was smashed, the house was wrecked, the bathroom, the toilet had been kicked in, there was blood everywhere, glass everywhere, and wee teenage boys were upstairs in the back room really, really frightened,” she said. Belfast-based Sinn Fein councillor Michael Goodman said there can be “no place for racism or any other forms of discrimination in our society”, and urged people to bring information to the PSNI.